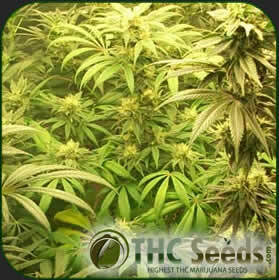 THC Seeds Company Welcomes you. Did you know all the famous marijuana seed breeder's come from Vancouver Island, BC? Our breeder is no different. He was actually born in a field of marijuana back in the early 60's. His mother was tending multiple gardens whenshe suddenly went into labour. When he was just a baby, his parents made him a cannabis babies carousel. As a toddler, his walls were covered in pot leaves, as were his bedding and clothing. He was comfortable around the smells of cannabis, and the surroundings of intelligent Physicists, Botanists and Doctors who socialized with his parent while enjoying cannabis. He learned to grow marijuna from the age of three, spending his childhood with his mother and her breeding projects. As a teenager, he began to study horticulture and everyone in his life guided him toward the top university for Botany and Plant Pathology. His studies took him deep into cannabis, cannabinoids and marijuana gentics, and he obtained his PHD in the very early 90's. And that's when he started his life long career breeding cannabis seeds for his company THC Seeds.